This morning a grandmother in one of the Facebook groups I belong to posted about how proud she was of her talented granddaughter and included a link to a piece by an NBC affiliate. Intrigued, I clicked. 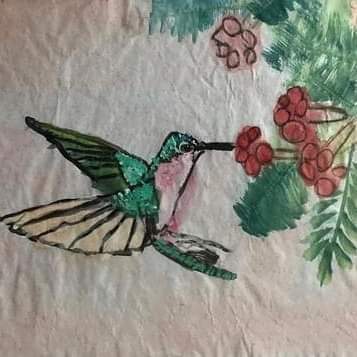 It was a story about Sophia Pineda and showed her creating some amazingly stunning paintings, like the one of this hummingbird. Sophia is just 14 years old. And she happens to have Down syndrome. I know, right?!?! I love stories like this because it makes the point so beautifully: Having DS does NOT preclude someone from having talent – and prodigious talent at that! I can’t wait to see where Frankie’s talents lie. Her future is as bright as anyone else’s. Sophia’s website is live, unfortunately the shop won’t be up until 2018. But I really hope you’ll remember her name if and when you need to buy a teacher’s gift or need some stationary or art for your home.